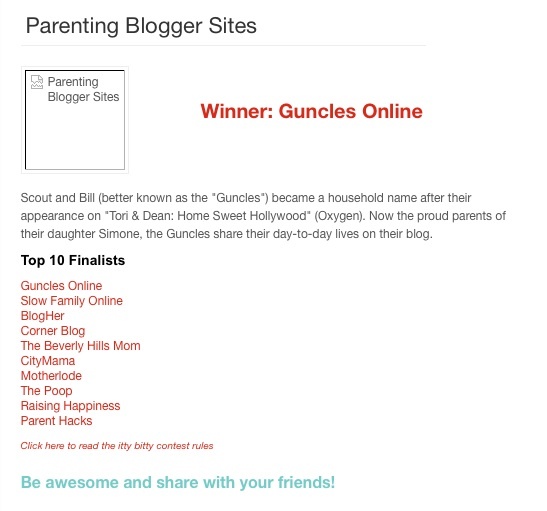 Last updated by suzlipman at April 29, 2016 . 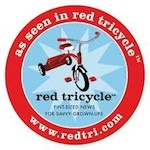 Looking for a great winter or family nature activity? Join the Audubon Society and Cornell Lab of Ornithology‘s Great Backyard Bird Count Friday-Monday, February 12-15, 2016, anywhere in the world. Anyone can participate, even if you only have 15 minutes and are completely new to birding. 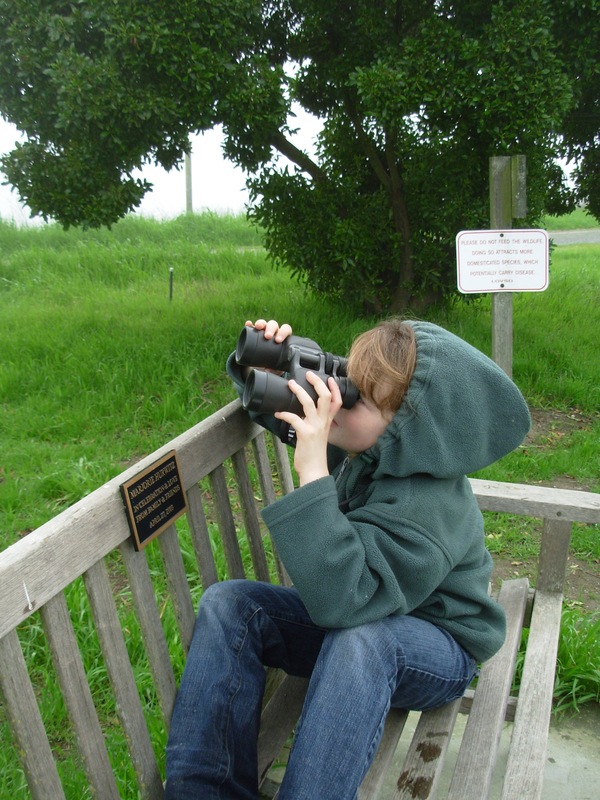 Here’s how it works: You can pick a spot to go watch birds (a backyard, a park, a trail, a marsh, or anywhere you think birds might be) or you can join an organized event. You can download a very thorough check list of birds that are likely to be seen in your area. You record the birds that you see and then go home and either send in your checklist or enter the names and numbers in online. There are lots more tips about counting and recording birds, tricky identifications, binoculars, and much more on BirdSource’s Great Backyard Bird Count page. 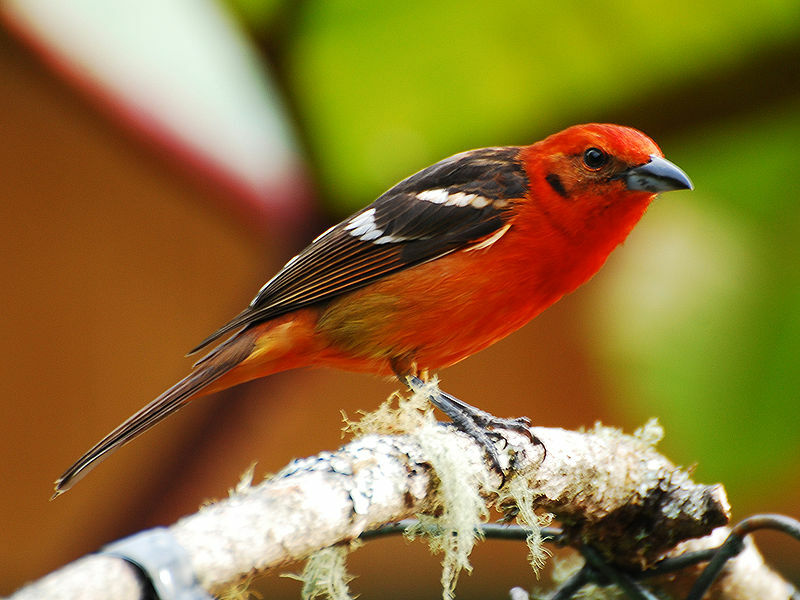 The site also features recordings of bird sounds and more activities for kids. 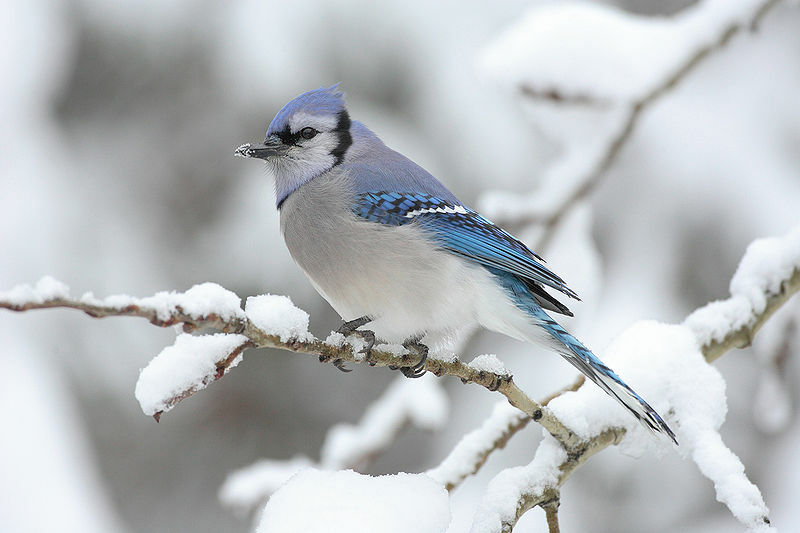 The All About Birds site has beautiful photos and information that can help you identify birds. These are the top birds that were reported during the count last year. So, why count birds in the first place, and why now? 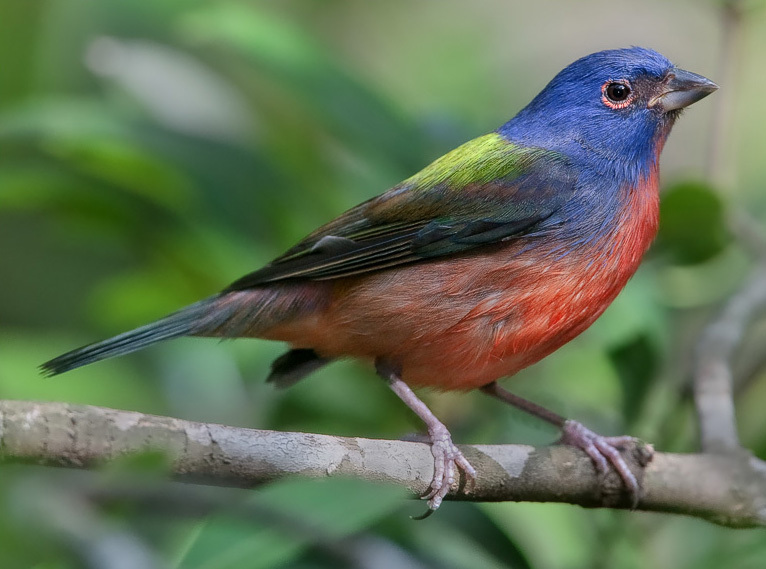 The Cornell Ornithology Lab, the Audubon Society and others use the information from the annual February count to track the health of various bird species over time and, in some cases, take steps to protect them. Mid-February has proven a good time to count, as it occurs just before the major Spring migrations. If you find you like counting, you can actually help year-round on various projects. Last year 147,265 bird watchers from more than 100 countries documented 5,090 species–or nearly half the possible bird species in the world! This year you could be part of the Great Backyard Bird Count. 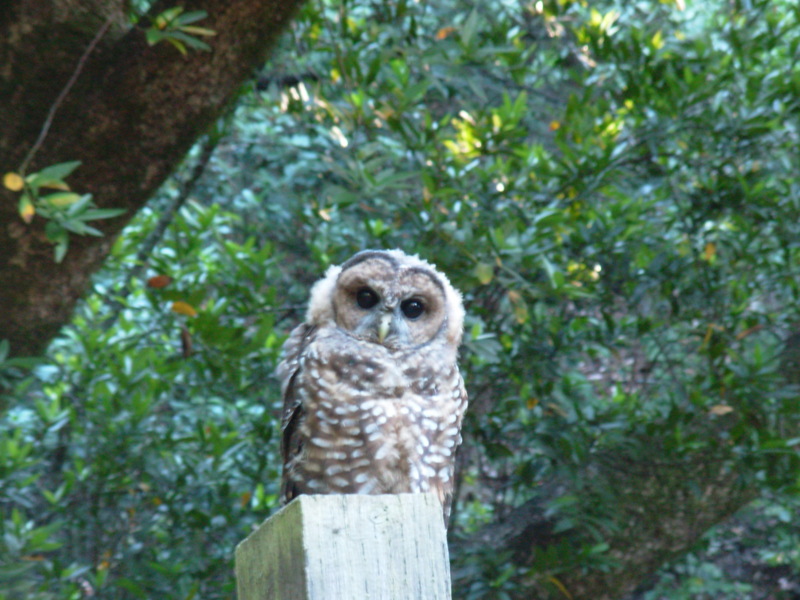 Read about and see pictures of the 2010 Great Backyard Bird Count. Make a valentine feeder for the birds. 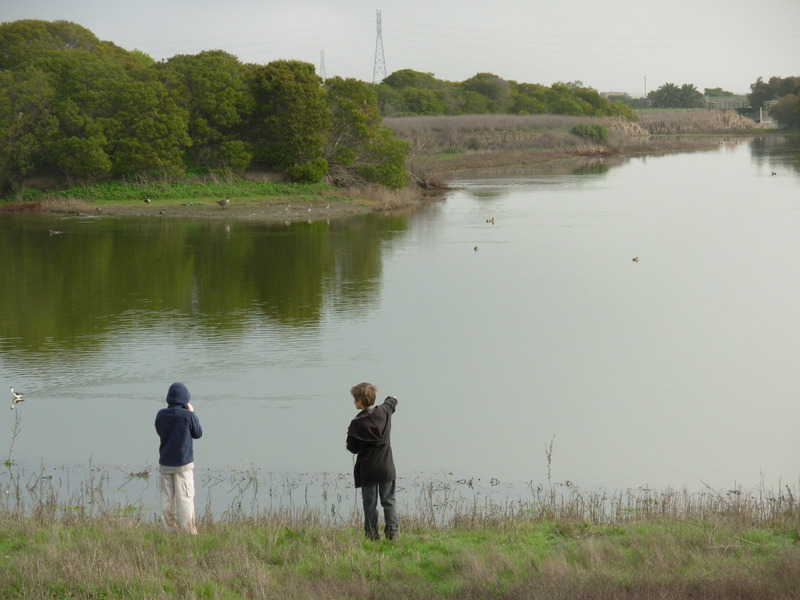 Get ideas for other great citizen science projects like Project Feeder Watch. Looking for a great winter or family nature activity? Join the Audubon Society and Cornell Lab of Ornithology‘s Great Backyard Bird Count Friday-Monday, February 13-16, anywhere in the world. Anyone can participate, even if you only have 15 minutes and are completely new to birding. Last year 142,000 bird watchers from 135 countries documented nearly 4,300 species–or about 43% of all the bird species in the world! This year you could be part of the Great Backyard Bird Count. I am very excited about the Audubon Society and Cornell Lab of Ornithology‘s upcoming Great Backyard Bird Count. It takes place Friday-Monday, February 14-17, all over North America. It’s a great family activity. Anyone can participate, even if you only have 15 minutes and are completely new to birding. Last year more than 17,400,00 individual birds were reported by more than 104,000 people. This year you could be part of the Great Backyard Bird Count. I am very excited about the Audubon Society and Cornell Lab of Ornithology‘s upcoming Great Backyard Bird Count. It takes place Friday-Monday, February 15-18, all over North America. It’s a great family activity. Anyone can participate, even if you only have 15 minutes and are completely new to birding. 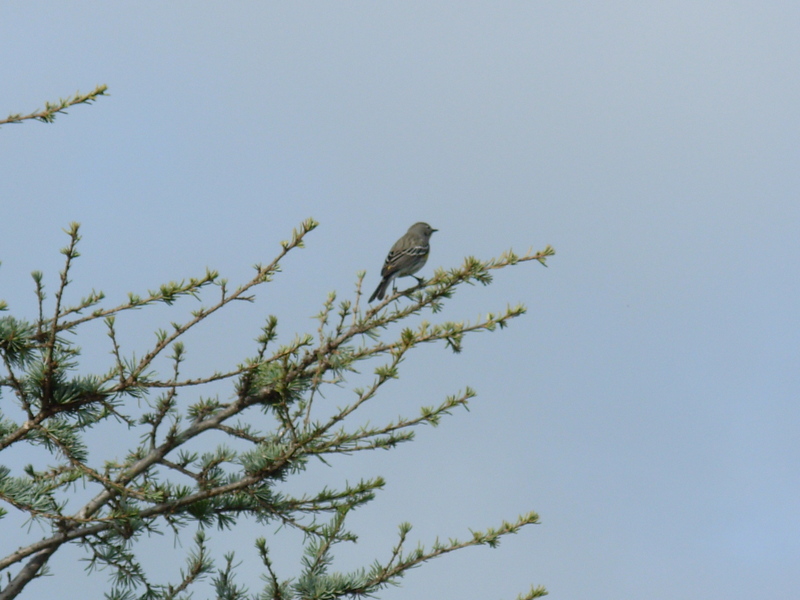 Our visitors this year include the blue Western Scrub-Jay, the very cheery House Finch, and a young Titmouse. Which creatures are visiting you? Tie the string around one end of the pinecone. In mixing bowl, combine peanut butter or other spread with meal. Spread that mixture over the pinecone with the knife or spoon. Pour the birdseed and feed ingredients onto the plate. Roll the pinecone in the seeds. Hang from a tree branch or window eave. I am very excited about the Audubon Society and Cornell Lab of Ornithology‘s upcoming Great Backyard Bird Count. It takes place Friday-Monday, February 17-20, all over North America. Anyone can participate, even if you only have 15 minutes and are completely new to birding. 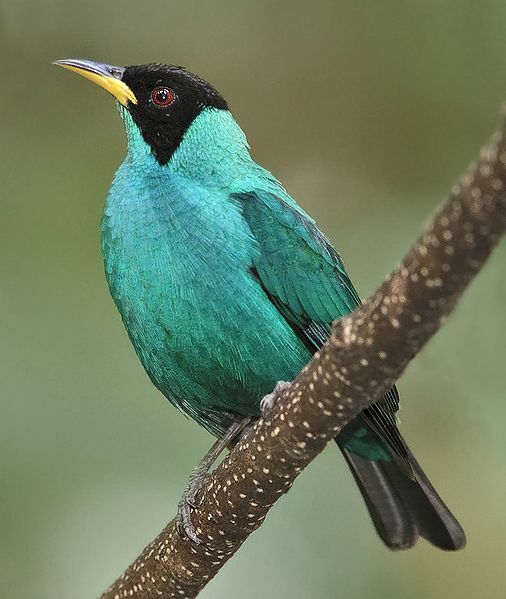 The All About Birds site has beautiful photos and information that can help you identify birds. These are the top 10 birds that were reported during the count last year. Last year more than 11,400,00 individual birds were reported by more than 92,000 people. This year you could be part of the Great Backyard Bird Count. 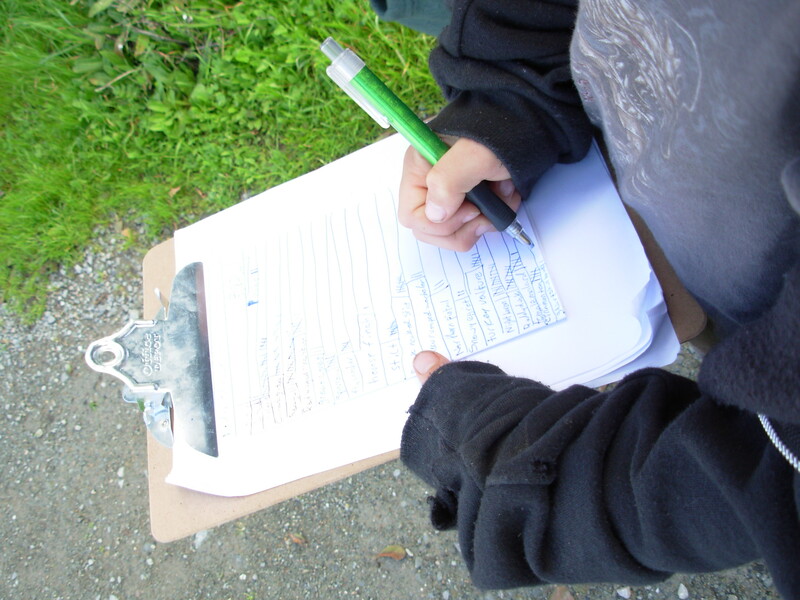 Get ideas for other great Citizen Science projects. On Saturday, some friends and I participated in the Great Backyard Bird Count, a 4-day event that is winding down today. 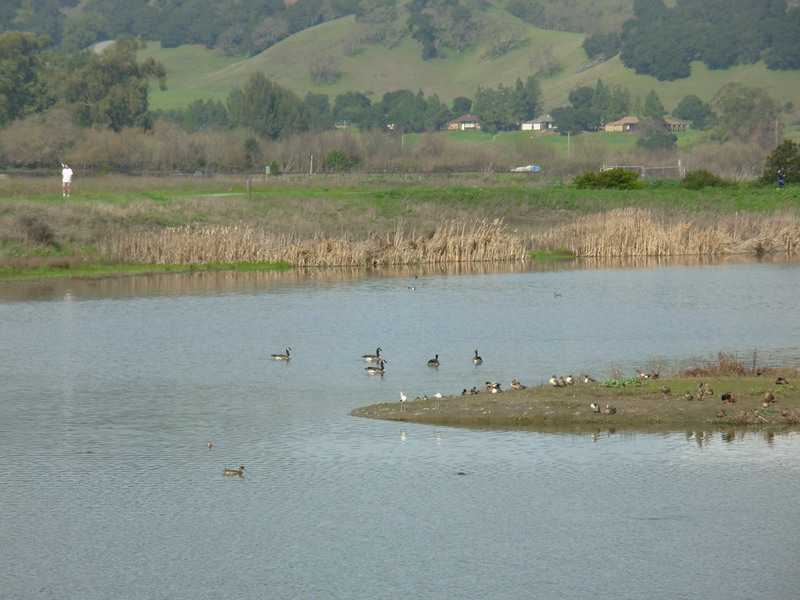 We had great fun and saw lots of birds while hiking around the Las Gallinas Wildlife Ponds in San Rafael, CA, a nearby place I’d never visited before! There’s still time to join this and other bird counts. In fact, they’re part of an ongoing effort by the Audubon Society and Cornell Lab of Ornithology to track, learn about, and assist bird populations. 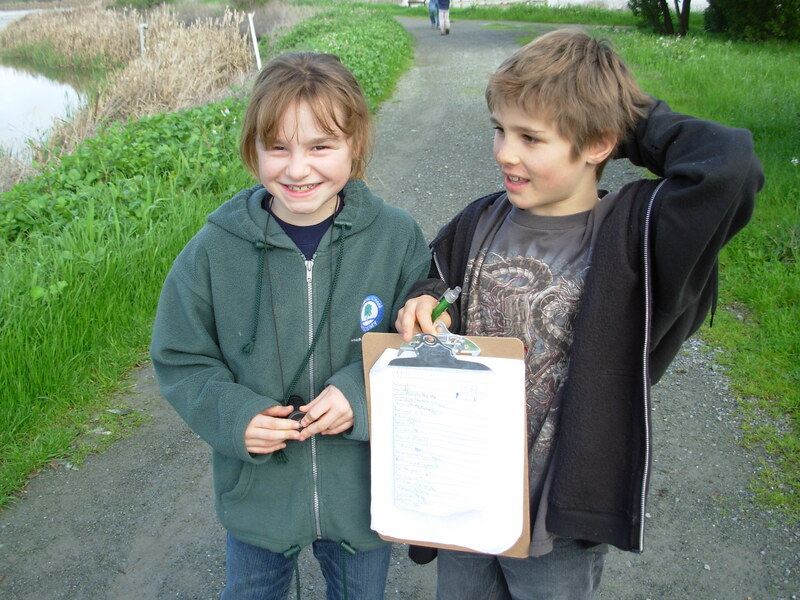 Here is complete information about bird counts and how you can get involved. In the meantime, enjoy our walk with us. 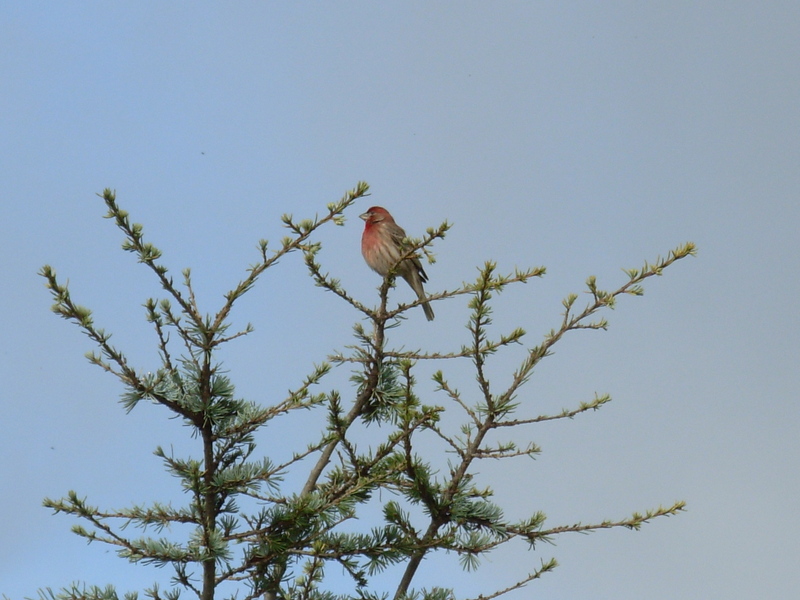 We immediately spotted lots of birds in the nearby trees, such as Yellow-Rumped Warblers, Red-Winged Blackbirds, House Wrens, and these Finches, both male (top) and female. The large ponds were teeming with bird life, both on water and in the trees. It was amazing what I could see in the trees with binoculars. It was as if a hidden world opened up. There were birds everywhere — white glints of gulls, herons, and egrets. (I admit I’m not sure what kinds. My friends, and their kids, were all much better classifiers than me.) Flocks of Canada Geese flew by and we did our best to count/guess how many there were. 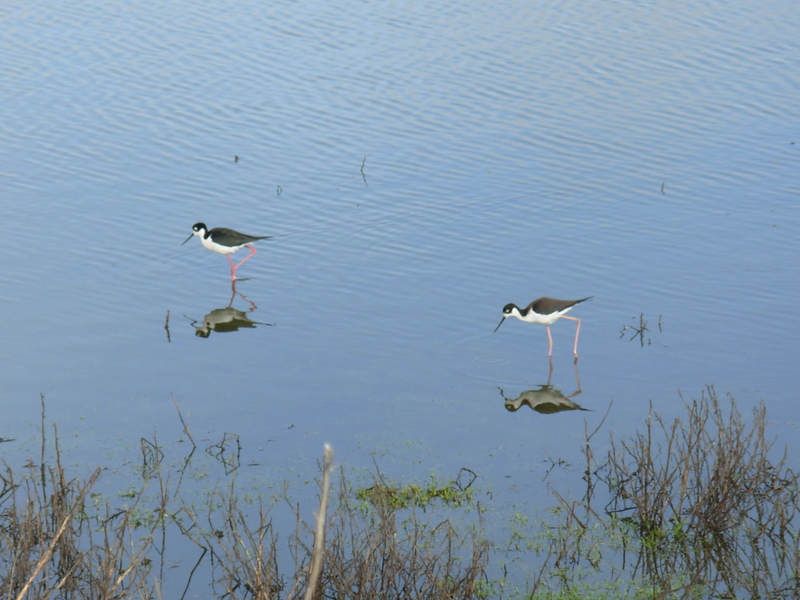 In the water were Avocets, and these graceful Black-Necked Stilts. 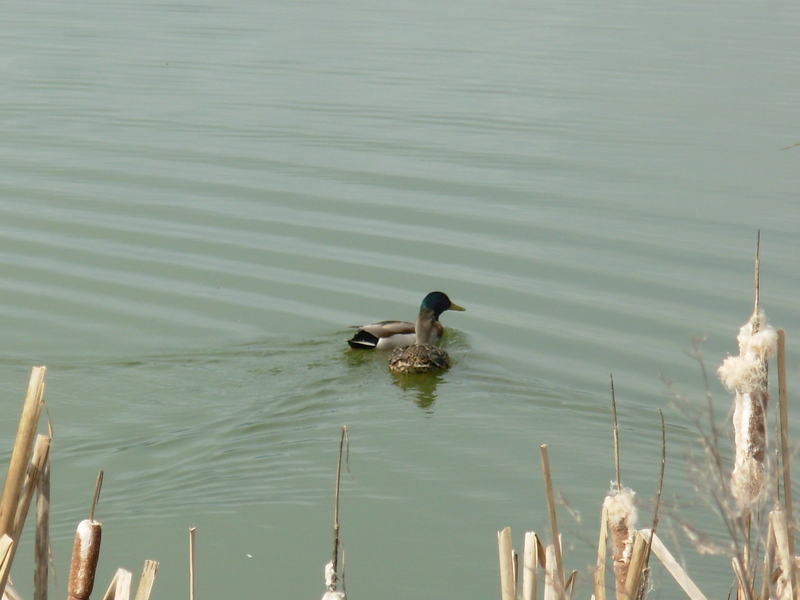 Plenty of ducks and geese swam by and called noisily to one another. Ducks we spotted included the poetically named Northern Pintail, Cinnamon Teal, Ruddy Duck, and, of course, the lovely emerald-headed Mallard. 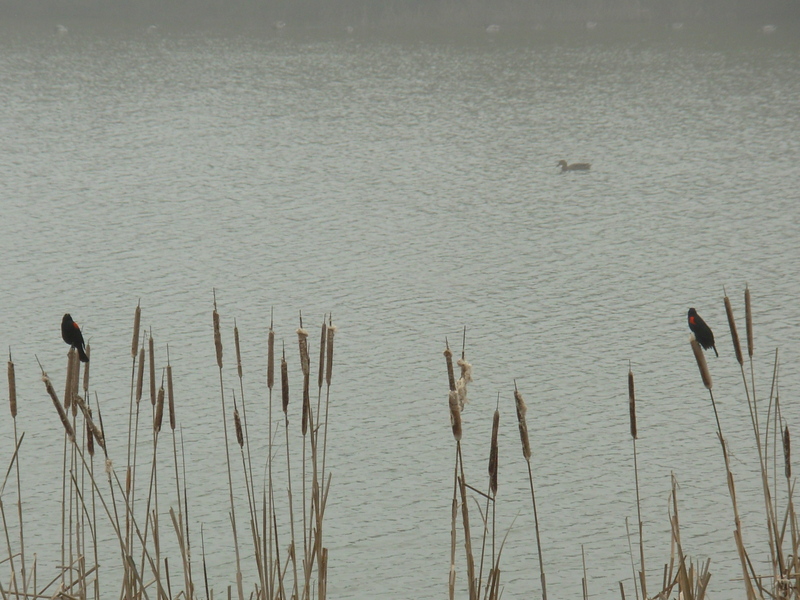 I’ll never forget the first time I saw a Red-winged Blackbird. It took me a moment to register the bright orange-red color on the tops of their wings. These seem in repose, watching a duck. We found a great stand of trees, hosting lots of bird life. (Quickly moving bird life, that seemed to sense when you were closing in with a camera, before flying away.) 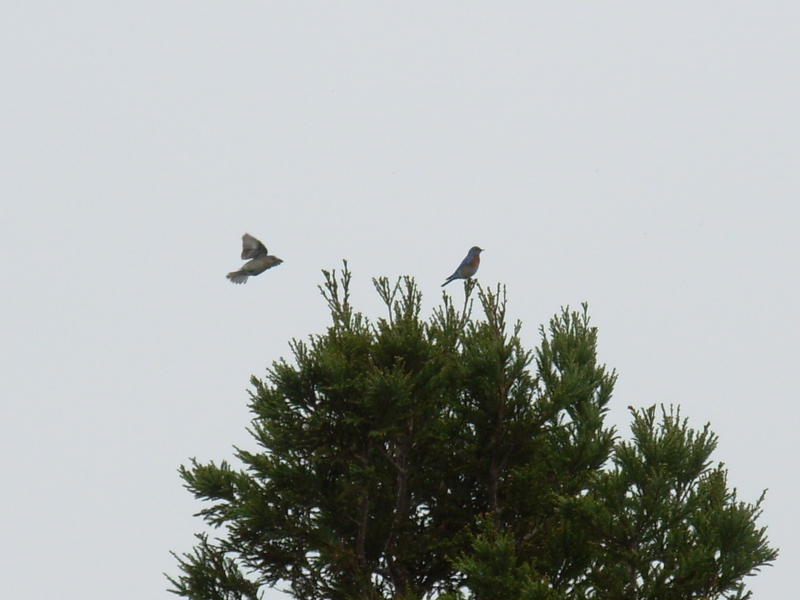 We were able to identify Robins and these Western Bluebirds. 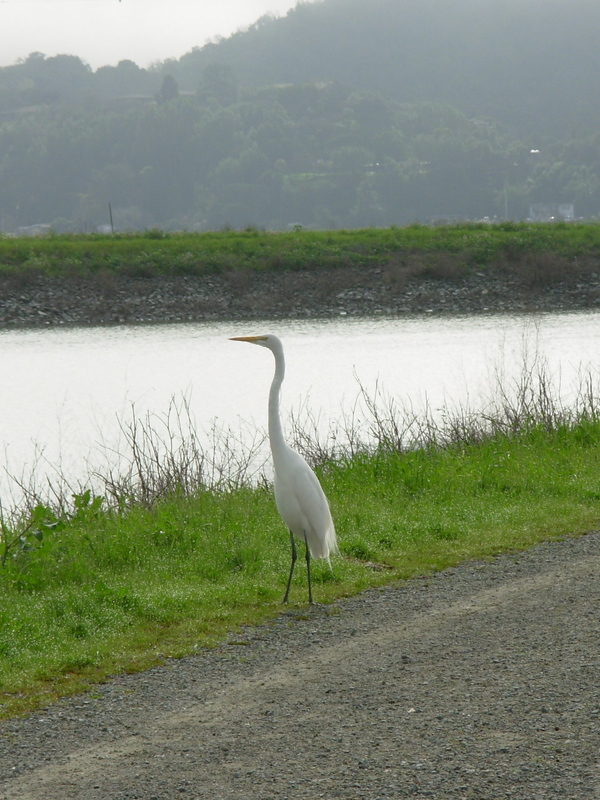 I quietly followed this Great Egret for a while. 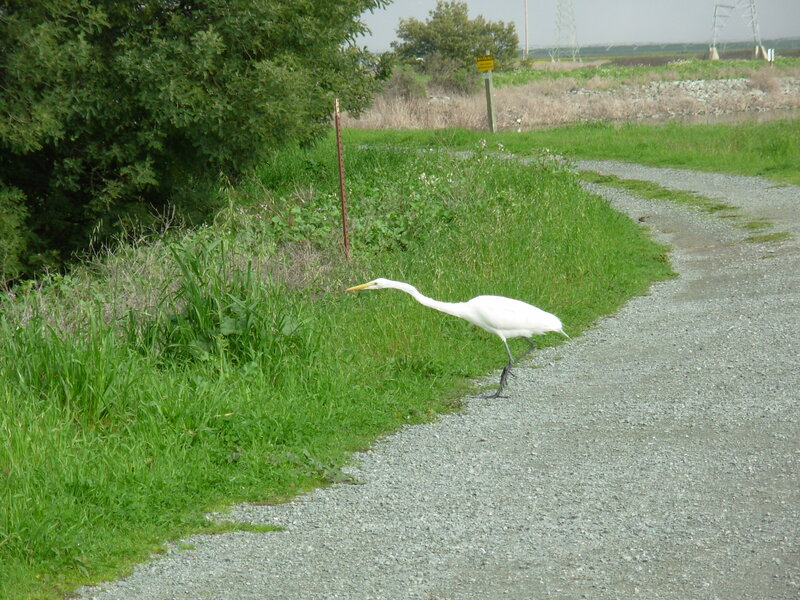 I liked the way he mozeyed down the trail, taking his time (Slow Egret? ), before sticking his neck out. 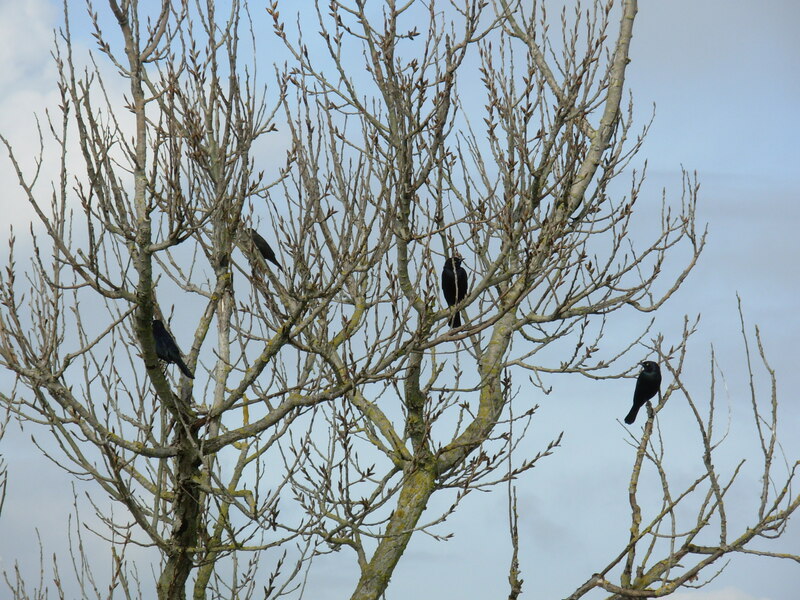 This tree was full of noisy, cheery blackbirds. You can listen to a group of blackbirds, seemingly signaling spring. 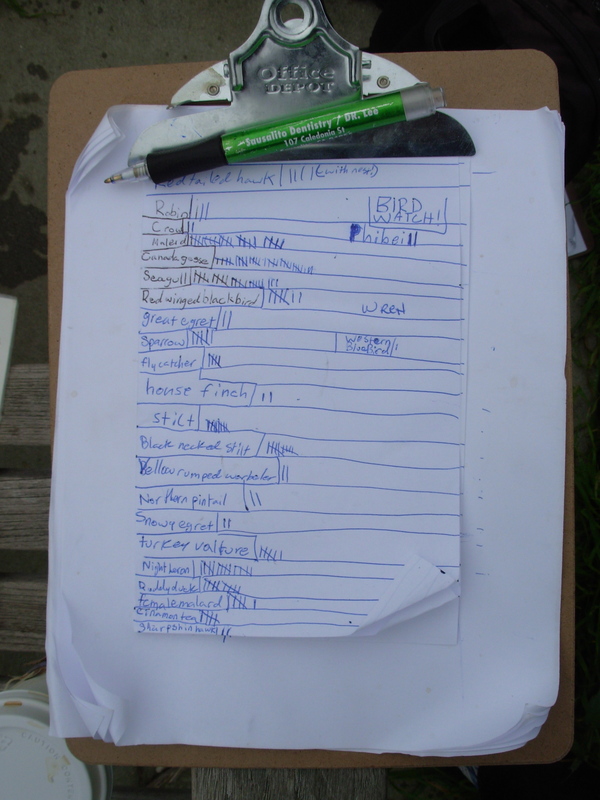 The tally for the Bird Count got entered online. As of mid-day Monday, there had been 46,912 checklists submitted, 553 species observed, and 4,531,433 individual birds counted. In a little over an hour, we contributed 170 birds in 24 species to the list in order to help the Bird Count get a snapshot of bird activity over a busy, migrating weekend in February. As for me, the activity really whet my appetite to do more bird watching and counting. Who knows? One day I might be able to identify those white birds in the trees. 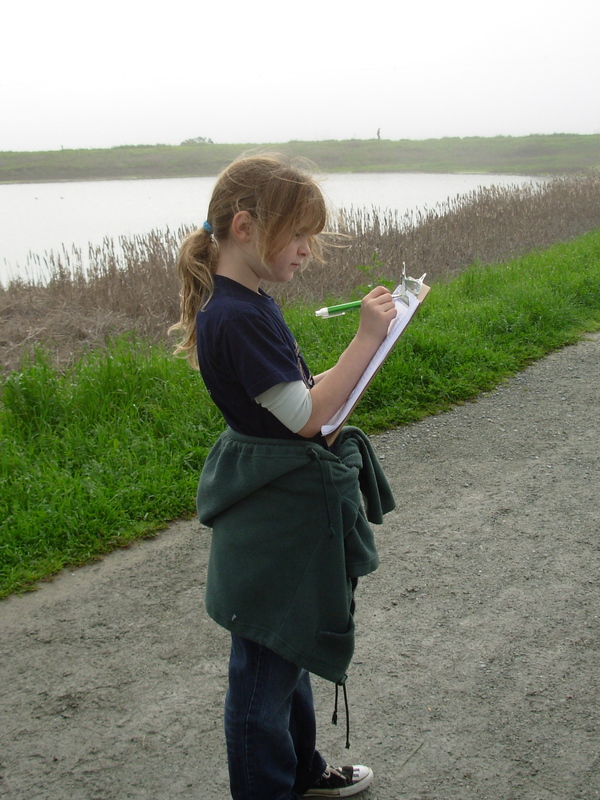 You might like these other citizen science projects. I am very excited about the Audubon Society and Cornell Lab of Ornithology‘s upcoming Great Backyard Bird Count. It takes place Friday-Monday, February 12-15, all over North America. Anyone can participate, even if you only have 15 minutes and are completely new to birding. Last year 11,558,638 individual birds were reported by more than 100,000 people. This year you could be part of the Great Backyard Bird Count.